Order your very own royal elm drawing table today, and transform your creative process into a practice in indulgence with a workspace constructed of rare woods and one of the most enduring surfaces you will ever find. 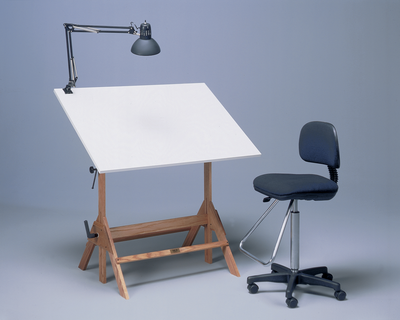 This drawing and drafting table is beautifully crafted using the choicest selection of royal elm, a wood known for durability and hardiness under working pressure. With a tabletop of 1,260 square inches, you can be sure your equipment is ready to handle any task you might bring, no matter how big or small. The hand-applied finish on the table is an all-natural and non-toxic tung oil, which adds even more to the strength of the wood by hardening and finishing it with a lustrous sheen. The tabletop itself is constructed of a tough wood composite coated in a near impervious coating of scratch- and stain-resistant lamination. It is the perfect addition to any home or office setup that requires both functionality and style by combining sought-after materials and rugged construction techniques.